John K. Mercer (right) is the MMS school head. John was a founding Board member of NATSAP, where he served as Treasurer and as the Chair of the Education Committee. He also served on the Board of Governors for PNAIS. He currently oversees the Outdoor Education Program at MMS. John has an MS.
Colleen Harrington (on the right, singing with MMS graduates), is the MMS assistant school head and formerly was a teacher at MMS. She is the admissions director and supervisor of the Academic Program. She has a BA. John and Colleen are married and have been together since 1982. They have two young daughters. 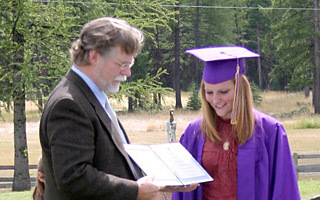 John and Colleen founded Mission Mountain School in 1990 with three other people, who have since retired. Our clinical staff currently consists of two people. Our clinical director is Timothy Wilcox, PhD. Tim is a psychologist with 25 years of experience. Jennifer Bosley (on the left), LCPC has 15 years of experience. We also have a licensed nurse, and in addition, we work with a consultant adolescent psychiatrist, Dr. Victor Houser. Our teachers have Masters degrees and/or are certified in the areas in which they teach. 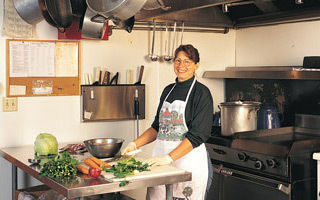 We have administrative staff, maintenance staff, and two cooks.